ConceptDraw MINDMAP since the 8-th version release, supports compatibility with MS Outlook. Essential to project management activities is the ability to manage your email messages using a mind map that is integrated with MS Outlook. A mind map topic, assigned as an “Email” topic type can be transformed into an MS Outlook message with one click. Open a ConceptDraw MINDMAP document. Open the Topic Type panel. Choose “Email” Topic Type, double-click and create your message using the Topic Data dialog. You can also attach file. 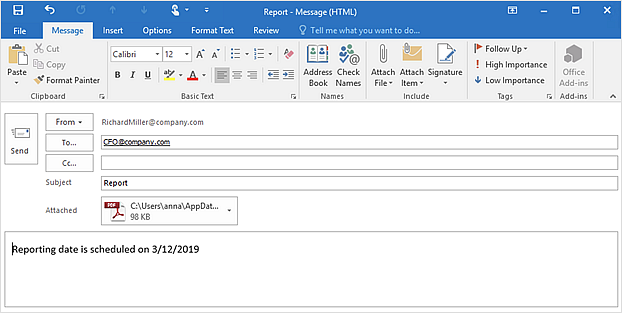 The mind map topic, assigned with “Email” Topic Type can be transformed into MS Outlook message using the Send to Outlook command. Find it in the Share tab (Windows), or in the Topic menu (macOS). Result: You can send messages directly from your mind map with one click. ConceptDraw MINDMAP supports sending the information from your mind map to your Outlook account. Your mind map information can be sent to MS Outlook with one click.